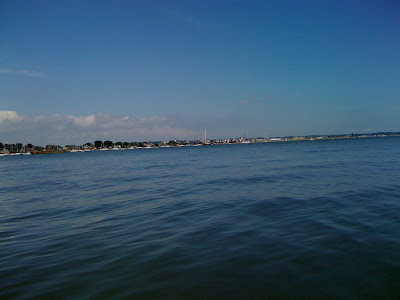 We mangies love our fish and we are fortunate to have a famous fishmongers shop a stone's throw away. Every saturday hubbie wakes up early ( amazing but true!) to get the choicest of the fresh catch. Just seeing all the wide array of fresh fish on sale and a crowd of fish lovers waiting to grab their own share sends bizzare signals to the brain and we end up buying a whole load of fish that can feed the neighbourhood!!!! 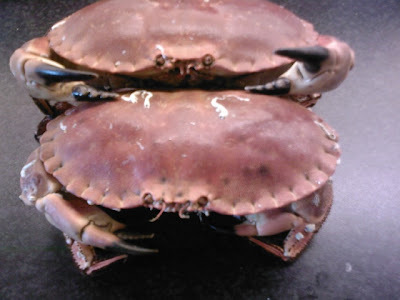 This Saturday we picked up huge crabs, mackerals, sardines and herring roes. 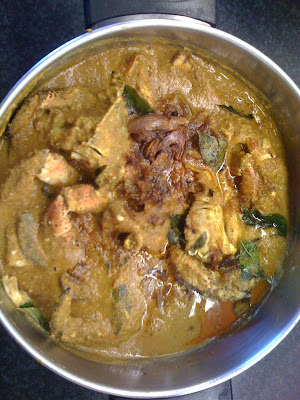 We returned home and marinated the fish with meet mirsang paste and made a traditional mangalorean curry with the crabs. We had friends over to share our meal. 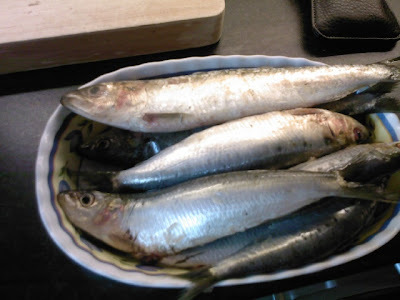 It was a hearty omega 3 feast. Very yummy had lots of eggs/ laak! 1. Lightly fry in some oil sliced onions and sliced garlic till brown and soft. Add grated coconut and fry till slightly browned. Keep aside. 2. In same pan lightly fry the whole dried red chillies, coriander, cumin, mustard and methi seeds till aromatic. Grind finely all the broiled ingredients in a mixie or in a grinding stone using 1/2 can of coconut milk. Keep masala aside. Retain the masala water by rinsing the mixie/ grinding stone with 2 cups water. 3. 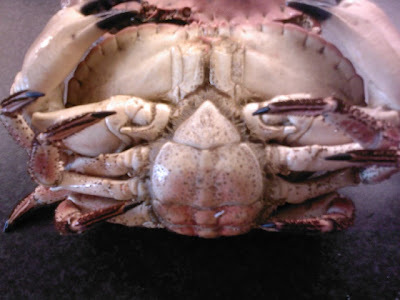 Clean and cut crab into large pieces, slightly break claws with a hammer or back of knife. Place in a large thick base vessel. 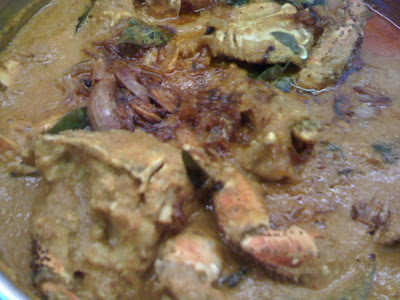 Add 2 cups of masala water, salt and tamarind extract, close vessel and bring the crabs to a boil 5-7 mins( medium flame). Add the ground masala, check for salt/seasoning. Close lid and bring to a boil again. .
4. For tempering: In 2 tbsps of hot oil add mustard seeds, when splutters add, curry leaves and crushed garlic and fry till garlic turns a golden brown. Add seasoned oil over crab curry. Crab curry is ready. Serve with boiled rice and vegetable sukke. 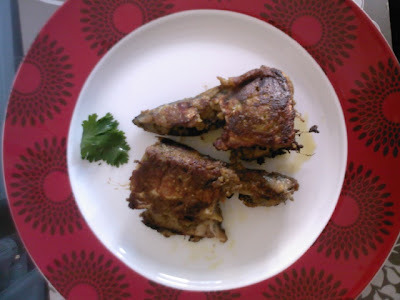 Mangalore Fried Fish in Meet Mirsang paste. 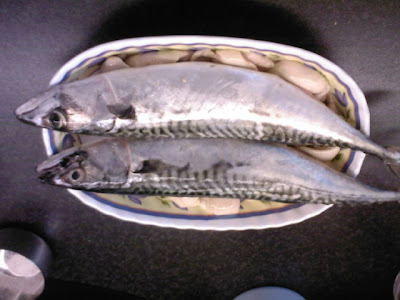 Place fish carefully in oil , reduce heat slightly and do not move fish till done on that side. Then turn over and cook the other side. Add more oil as require to prevent the masala burning. I am a mangalorean living in the US. It is so hard to find mangalorean food out here. Thanks for posting the recipes. I will definitely try to make the mit mirsang fish fry. Take care. By any chance do u know how to make the stew powder at home. I bring it from M'lore from the famous store (where they make it in the mill). Hi Jas.....so glad to meet a fellow mangalorean who enjoys good food....are you referring to the raysons stew powder from mangalore? ?.i like their powders esp their baffat too.i will post a recipe for stew masala powder soon....till then happy cooking!! Hi Jas....I hope you tried the stew powder recipe. It is under Pastes, marinades and rubs or Mangalorean Specialities. Let me know how you get on.